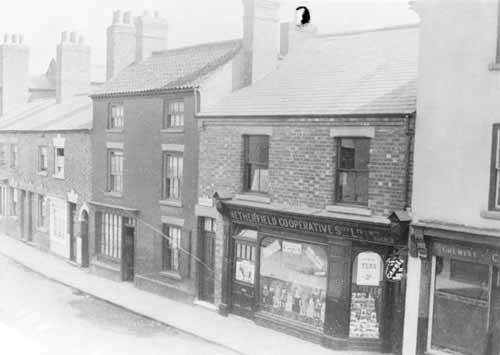 This c.1920s picture shows the end of the chemist shop on the right. From 1898 to 1926 this was run by Christopher Hume Cadge, he was succeeded by Walter Seaton. In 1953 the business was taken over by Edwin Dixon which closed finally in 1990. Next door is the Netherfield Co-op, selling tea for ‘tuppence a quarter’! All the houses and shops beyond this, up to the Market Place, have since been demolished. Just out of shot, on the left, was a small shop which, during WW2, was known as ‘The Welfare’, where orange juice, powdered milk and Cod liver oil, etc. were issued to mothers with babies. Photo: By courtesy of Nottingham County Council, Libraries, Archives and Information.